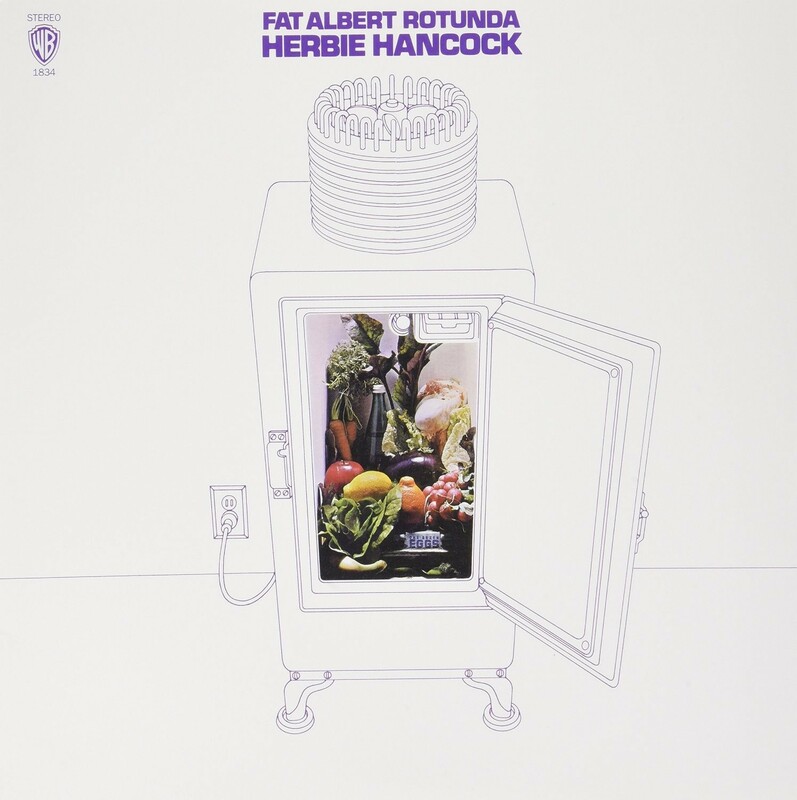 “Centered around some soundtrack music that Herbie Hancock wrote for Bill Cosby’s Fat Albert cartoon show, Fat Albert Rotunda was Hancock’s first full-fledged venture into jazz-funk — and his last until Head Hunters — making it a prophetic release. At the same time, it was far different in sound from his later funk ventures, concentrating on a romping, late-’60s-vintage R&B-oriented sound. with frequent horn riffs and great rhythmic comping and complex solos from Hancock’s Fender Rhodes electric piano. Through pulsating arteries, through pumping throes of peace. blasting, horses laughing, clowns prancing, people steaming. Coming down the hill, it is the long distance runner. To visit burning orchards, for the scent of heady hives. And even outside, so some say, but ne’er admit to his ascent. Along rumbles the runner, to his place the religious mat. And the rebirth of a burning town. He turns to run and pulse again, when he half stops to pause. Hancock was speaking with justifiable pride, given the parlous state in which most working jazz artists found themselves in the early 70s. He had not only kept his band together, but sustained a constant personnel for two of those three years, taking advantage of the familiarity bred by nightly playing to build a collective knowledge that informed every set. It would not last forever. By 1974, Hancock had reduced and reconfigured his instrumentation, adopted a funkier rhythmic slant and achieved pop-chart success. His sextet period was no mere transition phase, however; it resulted in some memorable and influential music, most of which was documented during Hancock’s affiliation with Warner Bros. If anyone was likely to beat the odds on leading a band in that rock-fixated era, it was Herbert Jeffrey Hancock, who had already shown an incredible knack for joining visionary impulses with commercial acceptance for nearly a decade. His first recording as a leader in 1962 had produced the blockbuster “Watermelon Man,” his 1965 masterpiece Maiden Voyage began life as music for a cologne commercial on television, and he had displayed singular range and flexibility with his score for Michelangelo Antonioni’s epochal film Blow-Up. Then there was the nearly six years Hancock spent in the Miles Davis Quintet, one of the seminal ensembles of that or any jazz period. Hancock was aboard when the trumpeter first added electric instruments, and would reconnect with Davis for influential recording sessions during the years that the music in the present collection was created. So Hancock had one of jazz’s more diverse palettes at his disposal when he formed his band-including a thorough knowledge of bebop, modal and free jazz, a pioneer’s interest in the electric, rock-inflected style that had not yet been dubbed fusion, and experience writing for other media that prepared him for all manner of compositional sound-painting. He also knew what kind of ensemble would offer the greatest possibilities, which is why he insisted on a sextet where the smart money would have told him to economize. The particular three-horn blend that Hancock favored can be traced back to his 1968 Blue Note album Speak Like A Child, where flugelhorn, bass trombone and alto flute were orchestrated in an expansive manner that revealed the influence of Miles Davis’s old friend and collaborator Gil Evans. The same options were available in Hancock’s first sextet, which is heard on the late 1969 sessions that produced the album Fat Albert Rotunda. The band had recorded The Prisoner for Blue Note earlier in the year which is closer to the searching impressionism of Speak Like A Child. Fat Albert Rotunda, in contrast, reflects the funkier electric avenues that link “Watermelon Man” to his contemporary efforts with Davis. The album, which is Hancock’s most commercial venture to date, was built around the original Hancock sextet that included Johnny Coles (trumpet, flugelhorn), Garnett Brown (trombone), Joe Henderson (tenor sax, alto flute), Buster Williams (bass, electric bass) and Albert “Tootie” Heath (drums), with studio reinforcements added. Given the functional nature of the music, the emphasis on funk rhythms is not surprising and sounds less dated a quarter-century later than the primitive electric piano that Hancock employs. Creating music around Cosby’s popular characters provided an effective opportunity to write popular music with some challenging wrinkles. For the most part, Hancock succeeded surprisingly well. After its mysterious introduction, with what sounds like a banjo/sitar hybrid and muted trumpet, “Wiggle-Waggle” becomes a funky celebration with clever rhythmic displacements and voicings passed among the brass and reeds. As responsive parts begin to accumulate, Joe Henderson launches a frisky, emotions-on-sleeve tenor solo as the ensemble shouts support. A typically open Hancock voicing, far removed from standard funk of this type, introduces a trumpet solo played by Count Basie alumni Joe Newman, who was in the trumpet section rather than the more introspective Coles. Newman’s shakes and the more complex backgrounds set up Hancock, who leaves a calling card of sorts with his opening solo break. His mix of riffing, counter-rhythmic tension, melodic flow and exclamatory trills feeds off the full band as it repeats the infectious theme to the fade. The groove is heavier on the next track, befitting a “Fat Mama.” The simple melodic material is embellished by evolving call-and-response figures from the horns that inspire Hancock’s piano inventions as surely as the lumbering swing of the rhythm section. “Tell Me A Bedtime Story” is the best-known composition from this session, and one of his most tender ballad creations. After a haunting trumpet introduction, the sextet states the theme (Henderson on alto flute), reinforced by the full ensemble on the reprise. The harmonic and rhythmic suspensions on the bridge, plus the quirky resolution of the main melody, add great character to an already memorable line. Hancock takes a gentle half-chorus before the theme returns and sets up a double recapitulation and quiet, tumbling coda. Lumbering funk returns with “Oh! Oh! Here He Comes,” which gains added heft as the trombones shoulder the theme. Hancock’s electric piano percolates under and between orchestral riffs, holding the groove and leaving space to appreciate Buster Williams’s earth-moving electric bass. Grand piano brings on “Jessica.” Garnett Brown’s trombone states the theme first, with Henderson’s alto flute trailing countermelodies. Then Johnny Coles takes over for a heartfelt flugelhorn lead as the ensemble spreads under his improvisation. Hancock follows with his only acoustic solo in this collection, offering another, more intimate opportunity to appreciate the supportive work of Williams and Albert Heath. “Fat Albert Rotunda” begins with a fanfare, which brings on the infectious theme. The two-note figure that underpins the performance is the focus of Hancock’s opening electric piano solo, which is spurred by an added (and unidentified) electric guitar. Henderson explodes into his tenor solo (the man has always known how to get started) and continues to wrestle demons as the signature vamp adds intensity underneath. The theme returns, with horn punctuations, before Hancock leads the fade out.